So I know this post is going up after Christmas, but I am hoping it will still come in handy for those of you who have some leftover eggnog in your fridge and are looking for a way to get rid of it. I made these for our holiday party because eggnog is such a classic holiday treat, but I personally have never been the biggest fan of drinking it. So instead of just serving it in liquid form, I figured I’d put it in a dessert. Plus, these were fun because they are mini and as I’ve mentioned before, small or bite size desserts always seem to do better at parties. The only slightly complicated part about this recipe is the pan. First of all, you have to buy a special mini cheesecake pan. I found one on Amazon, like this one. 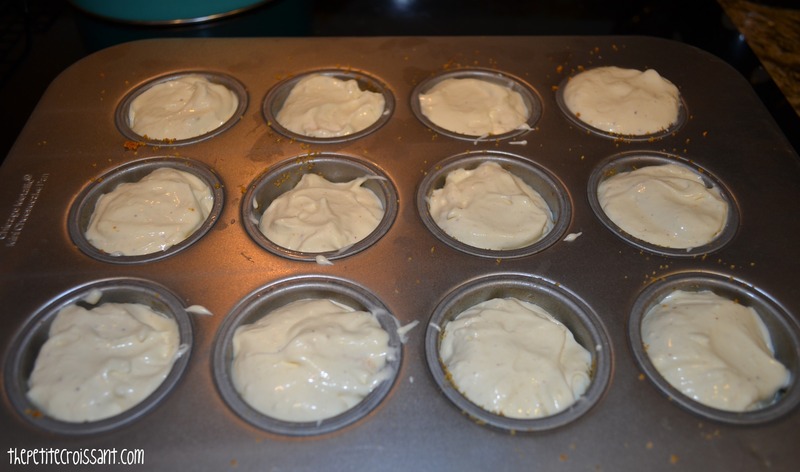 Then, getting the cheesecakes in and out of the pan takes a lot of patience. Plus, assuming you only have one pan, you have to do these in batches if you are making more than 12 (I made 36). Despite all of the hurdles involved, these were very popular. 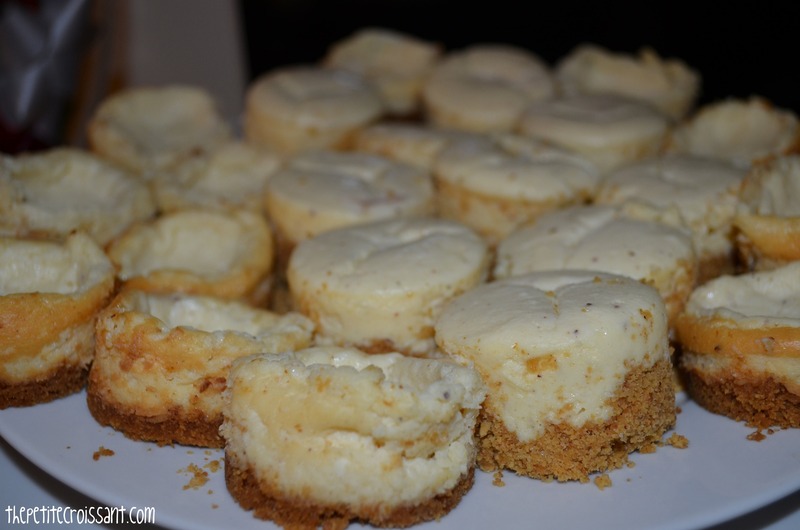 You can do the mini cheesecakes with any flavor, not just a holiday appropriate one. So if you’re like me, and you like to bake things like this just for the challenge (and because you know people will like them), go ahead. However, if you’re not a big baker and are easily frustrated, this may not be the best recipe for you. 1. Preheat the oven to 350 degrees. 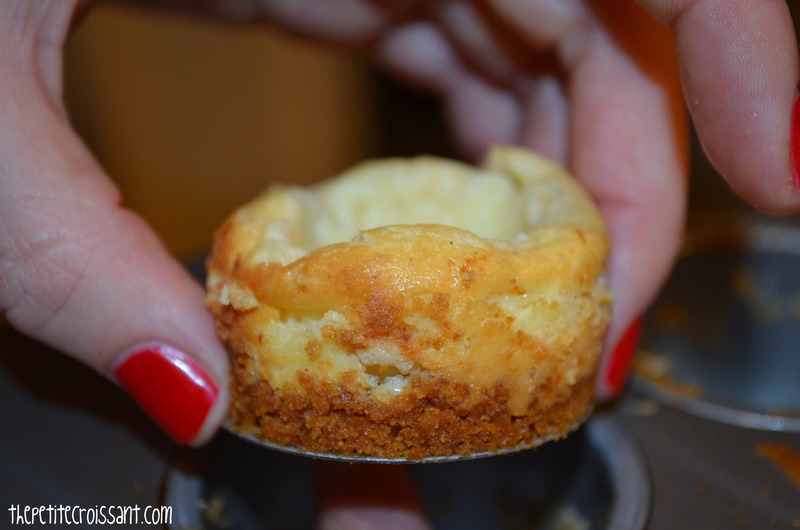 Heavily grease the mini cheesecake pan. Make sure to get all sides of each cup. 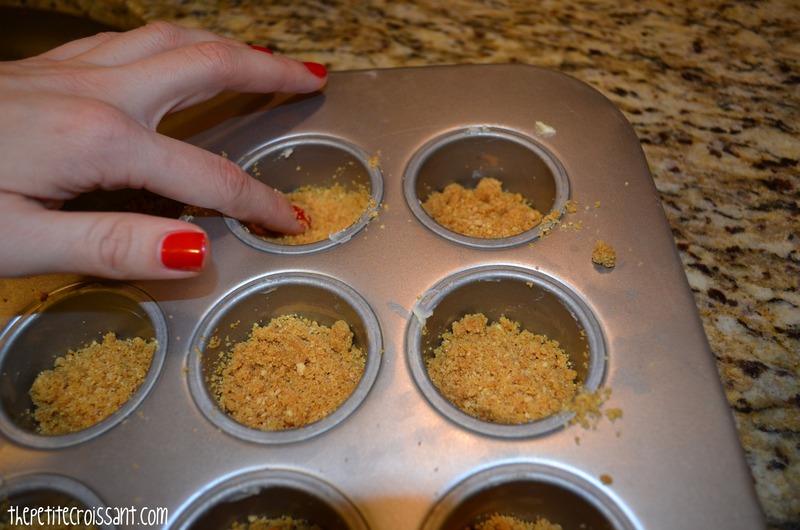 You will want to re-grease the pan each time if you are doing multiple batches in the oven. 2. In a large bowl, combine the crust ingredients. Once done, pinch some with your fingers and make sure it sticks together. If not, add one tablespoon of melted butter at a time. 3. 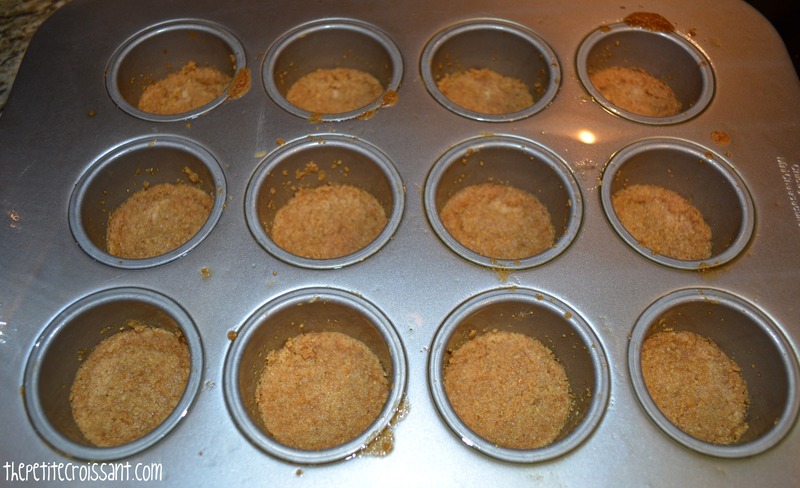 Evenly spoon crust into each cup of the pan. Press down firmly with your finger. Bake for 5 minutes. 4. 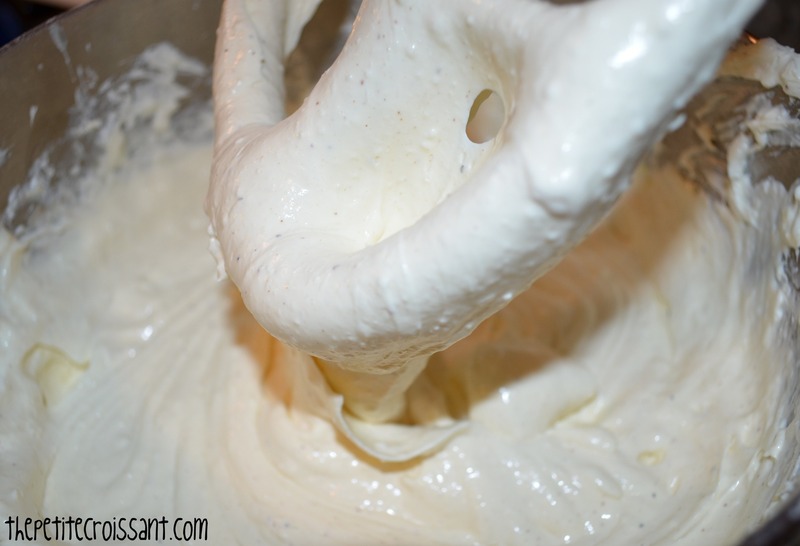 While the crust is baking, use your stand mixer fitted with the paddle attachment to mix the sugar and cream cheese. 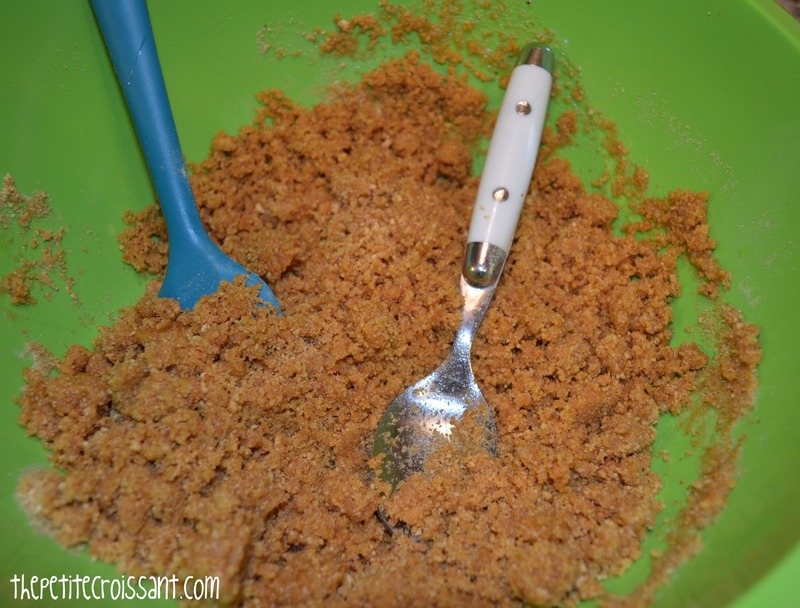 Once it is fully mixed, use a spatula to wipe down the sides. Then add the eggnog, flour, vanilla, nutmeg, and salt. Mix fully again and then add the egg. Mix again. Once it is fully incorporated, fill each cup about 3/4 of the way. Bake for 15-20 minutes. You’ll know they are done when the centers are almost all set, you want them to just be a bit jiggly. 5. 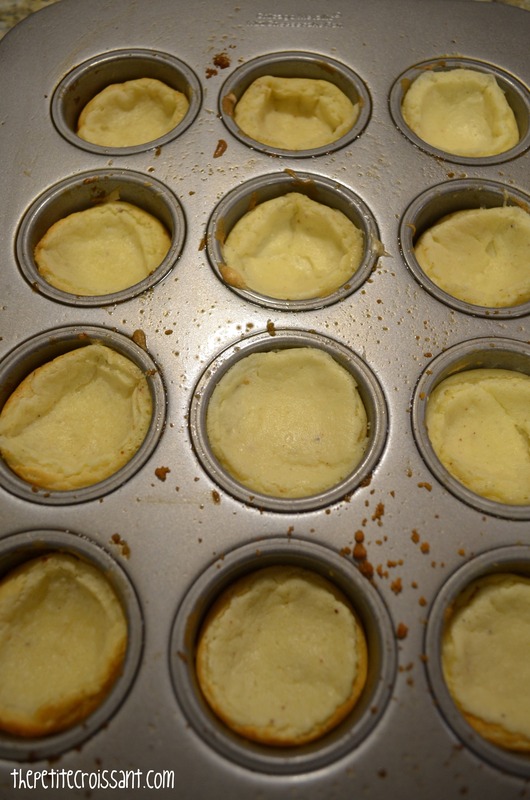 Once the cheesecakes are done cooking, let the pan cool for an hour. 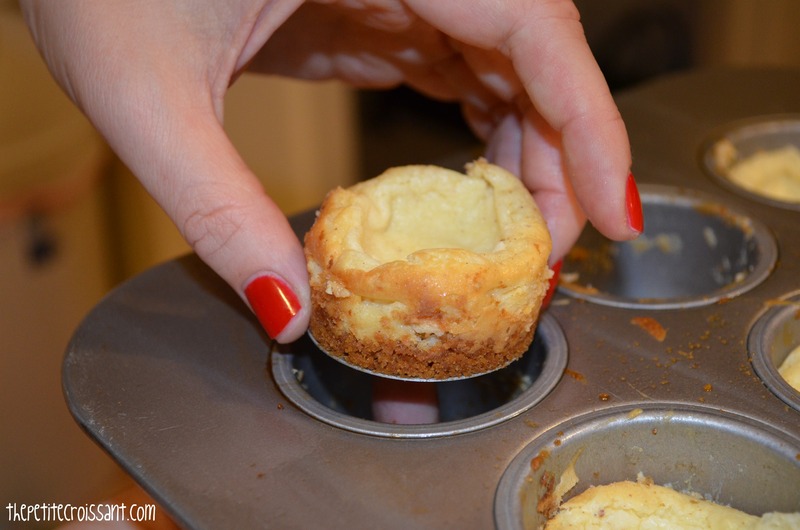 Then carefully push the bottom piece up to remove the cheesecake. I used a knife to then remove them from the bottom piece. Place them on a plate and let them stay in the fridge until you are ready to serve. I made these the night before and they were still great the next day. 6. If you want to serve something on top, add that right before serving.